Laser Hair Removal for the very hairy. In real need of some laser hair removal. Sid Schwab's blog has a post on young man who'd undergone surgery for a pilonidal cyst and has some comments on big hairy men, but it was this image that jaw-dropped me. High school must have been hell for this guy. I'm guessing that if you're offering a guarantee and this guy walks in, you might as well just close your doors. You should give your poor tech a bonus at the least. 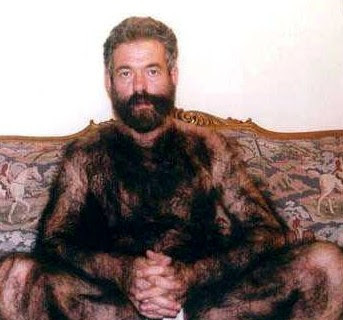 To my knowledge, we've never had a patient who had this amount of body hair but then again, I'm not in the treatment rooms. I'm wondering if anyone has any experience with the uber-hairy?